With Brown Bear as your animal birth totem, you are naturally detailed oriented. People can trust you to cross your T’s and dot your I’s with perfection. You do not laud this over others, however – humility is your middle name. Astrologically speaking, Bear people typically optimistically press themselves to do more and achieve more particularly in the pursuit of spiritual insight. One of the potential spiritual lessons Brown Bear might need to work through is that of having persnickety expectations of others to the point of coming across as hypercritical and pessimistic. Brown Bear people think deeply about life and observe it with equal care. Each experience affords a chance to learn or understand something new. Even the task of seeking out grubs reveals a diligent and curious nature that, as the Bear matures, integrates into the matrix of their soul. If you are a Brown Bear, you may find yourself a little too stuck in the concrete world. This means one of your challenges is opening up to input from your Higher Self and the divine. Ultimately this is necessary for your times of hibernation so that even as you sleep you will sense both threats and opportunity. When you come out of your cave, it is a type of rebirth and there will be new goals and a fresh awareness that guides you. 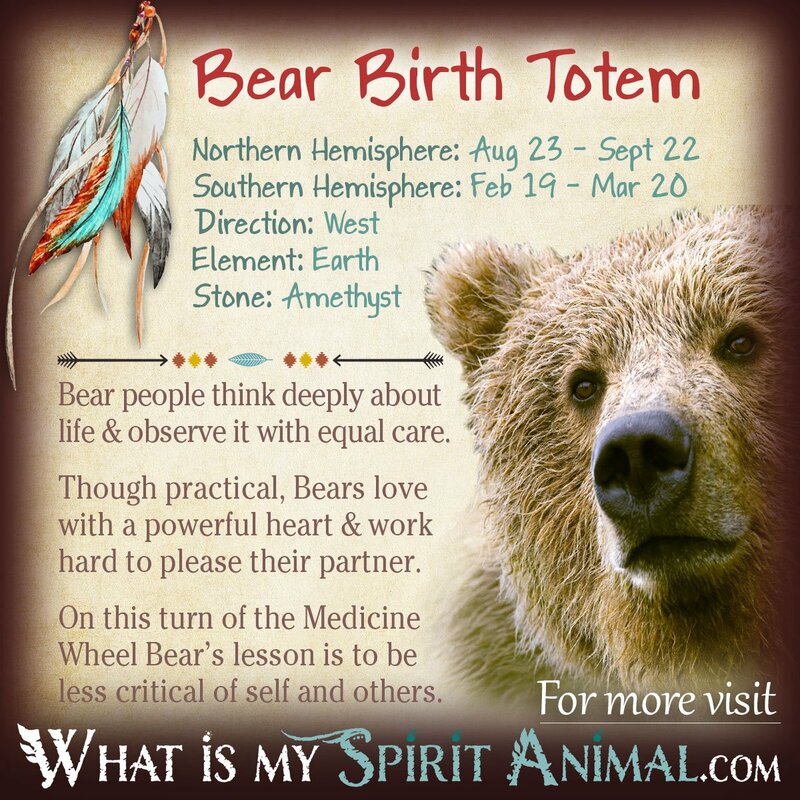 Those born bearing the Native American Zodiac Sign of Brown Bear are under the influence of the West Wind, the cardinal direction of West-Southwest, and the Element of earth. The West wind simmers with emotions and acts as the gateway to other realities. Bear people may find they have a natural aptitude for walking between the worlds, and sense a strong connection to the Star-Beings, the Ancestors, and Devic realms. The Element of Earth serves Brown Bear well because it gives them the stability they crave and the common sense to know how to get things done efficiently. People come to rely on Brown Bear for sensible forward-thinking and suggestions. Additionally if you are a Brown Bear you may have true-sight and clairvoyant talents – embrace them. They are part of your medicine. Brown Bear’s season is the harvest – a time to carefully gather your treasures and preserve them for the uncertain weather ahead. This symbolism impacts Bear dynamically in recognizing Her blessings, including an awareness of Her potentials and the inner spiritual world. As Brown Bear matures She will build on the lessons and rewards of previous seasons to continue her journey on the Wheel. In nature, Brown Bears see everything from roots and honey to fish as an opportunity to refill that inner well, and that’s exactly what they do with focus and effort. The challenge here is avoiding becoming so focused that you miss global insights that can guide you toward manifesting your goals and dreams. When Bear applies vision, imagination, and practicality – that is where they shine. If you have a Bear partner he or she wants to “fix” things, especially if they find injustice lurking in the forest. That’s when Brown Bear shows fierce courage and begins problem-solving. The Native American Zodiac sign of Brown Bear has ties to the Turtle clan, joined by Beaver and Snow Goose. The Turtle clan craves security. For Bear, His security isn’t a shell but a sturdy cave that keeps them close to the Earth while providing protection and support for the Sleuth. The crystal for Bear is the peaceful, healing amethyst and that gives Bear greater focus as well as perceptive abilities. It’s joined by the Violet, which is also a healer and protector. In matters of the heart, the Native American Zodiac Sign of Brown Bear has difficulty with self-confidence. This animal totem birth sign wonders why anyone would want a lasting relationship. However, once Brown Bear finds a positive companion, He/She is eager to please and tease. There is a flirt hiding under that fur, one who will be a tender, slow lover. If you have a Brown Bear partner be ready to meet high expectations. Know, however, that Bear expects just as much from Him/Herself. Signs that mate successfully with Bear include Snow Goose, Beaver, Wolf, Snake, and Woodpecker. Brown Bear people do well in positions where logic plays a key role. They are excellent analyzers and teachers. In assistant-type positions Bear is loyal and sticks to instructions like glue. Employers can depend on hard-working Brown Bear for follow-through, timeliness, and attention to detail. Some positions that suit Brown Bear include financial adviser, mathematician, researcher, technical writer and many healing professions. Just did the quizz to find my spirit animal is Bee… I was just told by a friend today that this is what they find they enjoy about me. I am following the save the bees programs worldwide already. Hi There, After being invalidated my whole life about being able to “know” people’s intentions, their pain etc. I learned about empaths which I am. But I also “feel” literal pain through others. I’m 62 aND about 1 year ago my pug suffered excruciating pain. My husband and I were driving so ewhere with him between us. He was a bit mopey, but not outwArdly showing it. All of a sudden I said “Brutus needs to see the vet NOW! Before I could even think about it I called our vet and said I’m bring in Brutus on an emergency. I made my husband step on (he was bewildered) and it took us about 10-15 minutes. By the time we got here he was in so much pain his pupils were dilated and he was shaking. My husband and I were watching him with agony in our hearts. They gave him morphine and we subsequently learned had hip dysplasia, crushed discs and wasting of his back legs. He is so stoic we knew nothing of his pain prior. They gave him 4 pain meds to take home which I gave him according to instructions. A month or so later it just came to me to put my hands gently on his back and draw the pain away with the light, and throw it away from ME! He has never had to take the pills since! Then I used it on our friend; all his pain left. So I think k I’m an empathetic AND healer but I don’t know how to protect MYSELF from negative vibes or bad people’s bad intentions. Our friend said to me look at the symbolism of bear claw. And here I am. Any words of wisdom? What is the difference between of the Northern and the Southern Totems of the Bear? What is its n=meaning in other words?